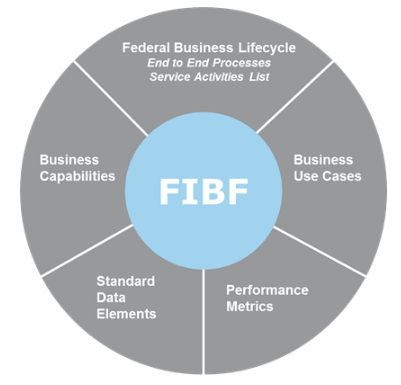 What is the Federal Integrated Business Framework (FIBF)? 1. Federal Business Lifecycles, service areas, functions, and activities serve as the basis for a common understanding of what services agencies need and solutions should offer. 2. Business Capabilities are the outcome-based business needs mapped to Federal government authoritative references, forms, and data standards. 3. Business Use Cases are a set of agency “stories” that document the key activities, inputs, outputs, and other LOB intersections to describe how the Federal government operates. 4. Standard Data Elements identify the minimum data fields required to support the inputs and outputs noted in the use cases and capabilities. 5. Performance Metrics define how the government measures successful delivery of outcomes based on timeliness, efficiency, and accuracy targets. How is the FIBF being built? The FIBF is being developed and defined by cross-agency working groups led by the respective Managing Partner/Service Area Lead. As a part of the development process, the FIBF is also being examined from a cross-functional perspective by the Business Standards Council. This is a key component of achieving a cross-functional, interoperable set of government-wide standards for administrative services.